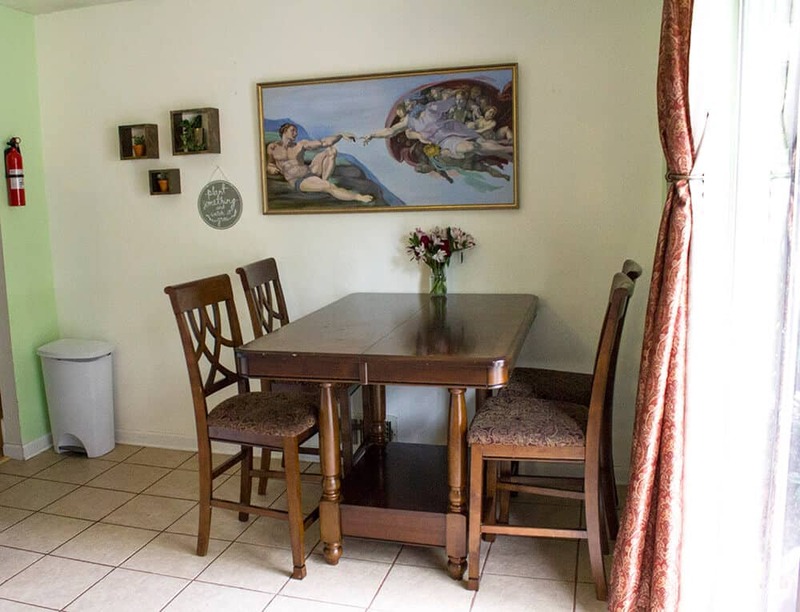 A few months ago, I moved my family into a cute and charming home with a great backyard. There are so many things I love about our new house, but there was one thing that I wasn’t crazy about. 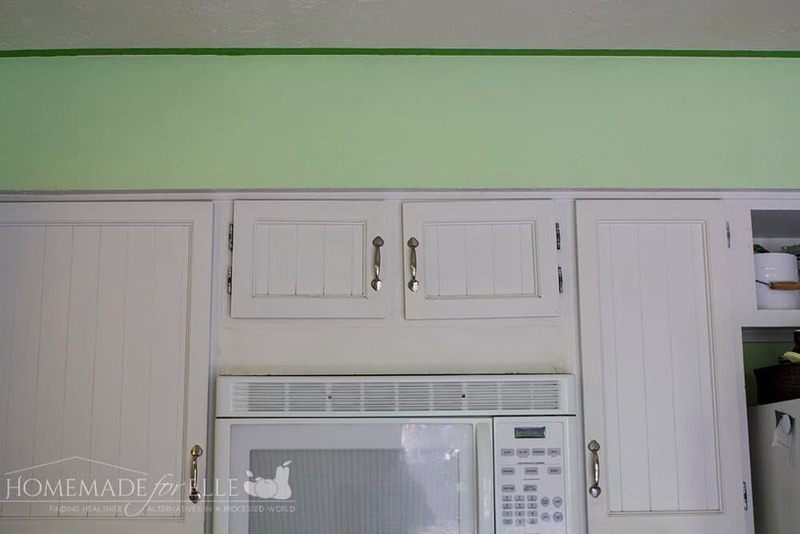 The color of the walls in the kitchen. 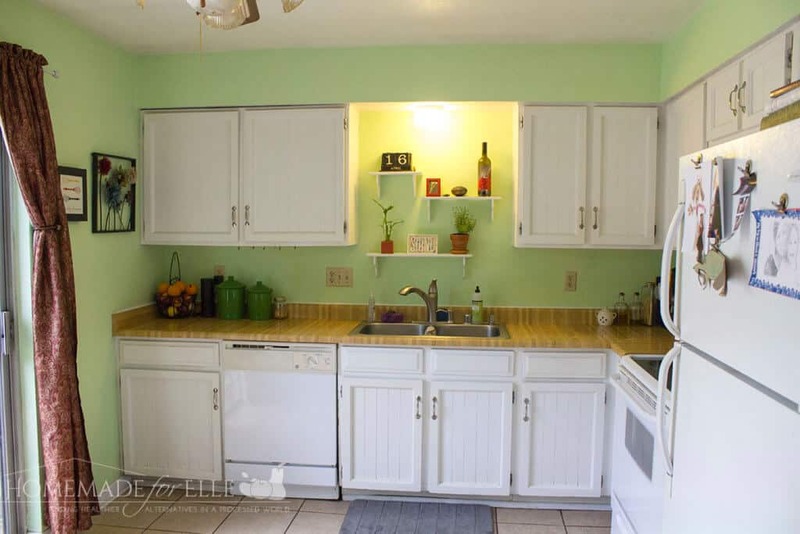 The kitchen was painted a sorbet green that, while cheerful, was not at all my style. I also felt like the color of the walls was poorly matched to the painted cabinets, and it highlighted any dirty finger prints left by 2-year-olds (and I’ll be honest, there are lots of little finger prints). I decided to make use of the weekend and repaint my kitchen. 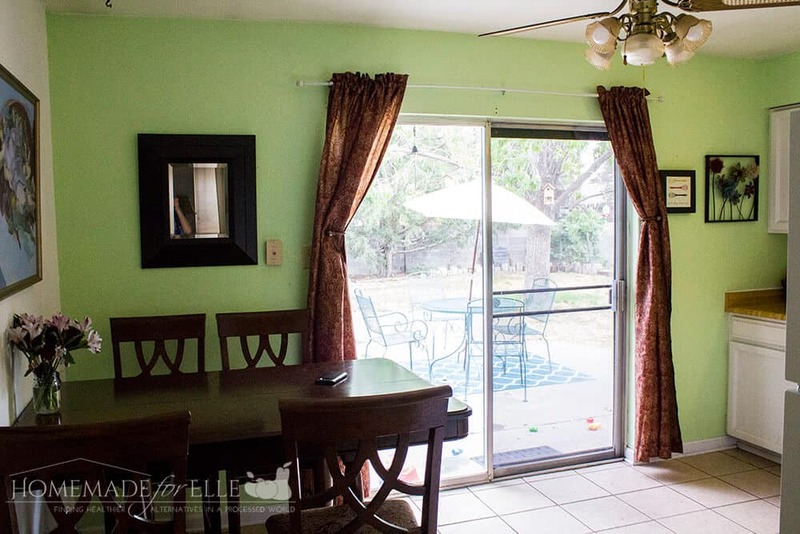 I wanted three walls to be a lighter color, and then to have a strong accent color on the wall leading to my backyard. I was viewing the different 2017 FrogTape® Design Trends and was completely in love with the Haute Homemade, and wanted to emulate something in that trend. So, my boyfriend and I picked up swatches and picked our paint! We ended up picking a really bold color for the accent wall, that contrasted greatly with the white baseboards and white painted cabinets. I wanted to be EXTRA careful and sure that we weren’t going to have any bleeding of the bold color into the white, so I picked up FrogTape® Multi-Surface paint tape. In my experience painting many, many walls, the trick on how to stop paint bleed through tape is to buy the right kind of tape. And believe me, not all painter’s tape is created equally. I have found that FrogTape® Multi-Surface painter’s tape is superior to other brands of painter’s tape. This is because it’s treated with patented PaintBlock® Technology – which means that FrogTape contains a super-absorbent polymer that instantly gels with the water in latex paint, giving you a perfect seal to prevent bleeding. By burnishing the edges of the tape, I made sure it was properly bonded to every surface, whether it was the ceiling, baseboards, or cabinets. 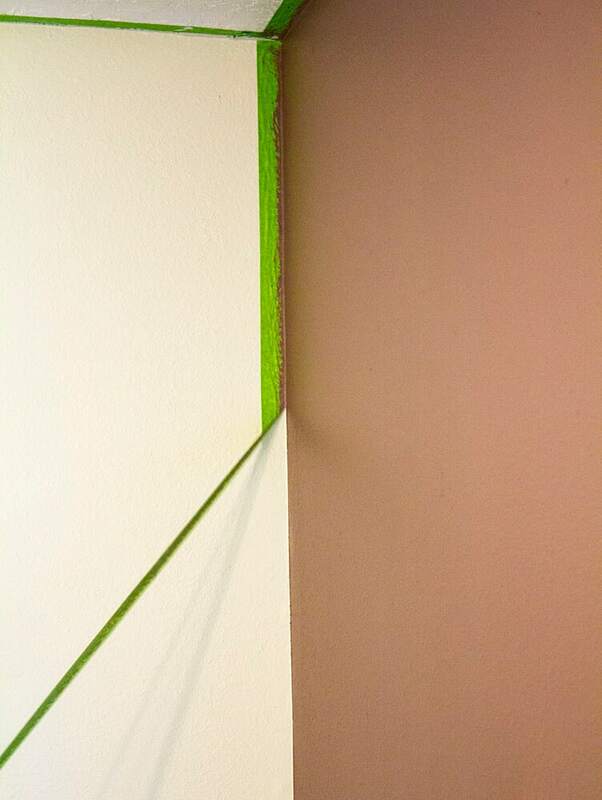 While applying the FrogTape® Multi-Surface painter’s tape, I found that the tape stuck strongly to the surfaces, making it easy to apply in long strips. The whole taping process only took about 20 minutes. When we were taking the FrogTape® Multi-Surface painter’s tape off the next day, I was SUPER impressed with the clean lines that we had! I have never had paint lines that crisp before. I am so thrilled with how my newly painted kitchen turned out! 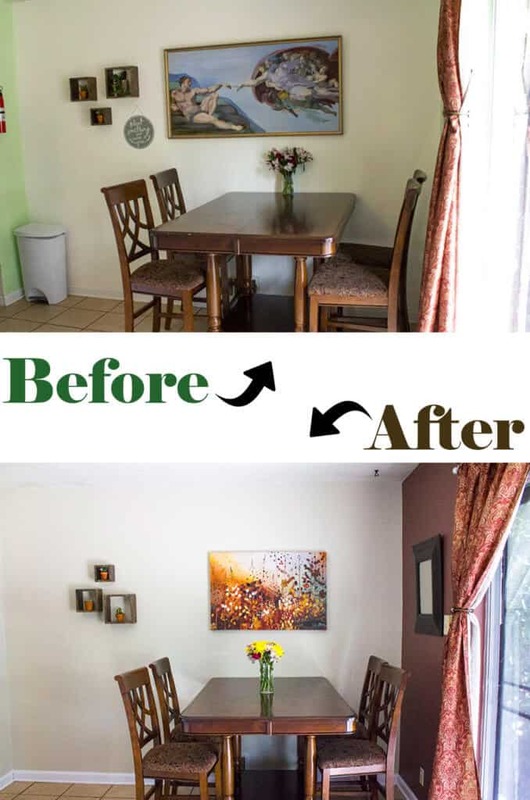 Here are before and after shots: It’s amazing how much better a room can look with a new accent wall and some fresh paint! If you have any painting on your to-do list, be sure to check out the 2017 Design Trends, created by Taniya Nayak, for inspiration! And don’t forget to pick up FrogTape® Multi-Surface and FrogTape® Delicate Surface painter’s tape for all of your painting projects! 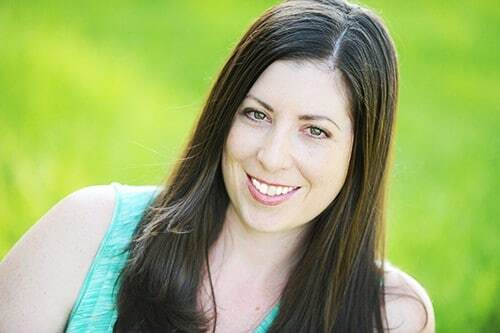 If you’re on social media, follow FrogTape® on Pinterest, Instagram, Twitter and Facebook! This sounds interesting. I love the fact that it helps the painting job easier and precise. This was very useful for me because I will soon be painting. I am PRETTY SURE my husband has this stuff – cause he is quite possibly the most handy person I know! 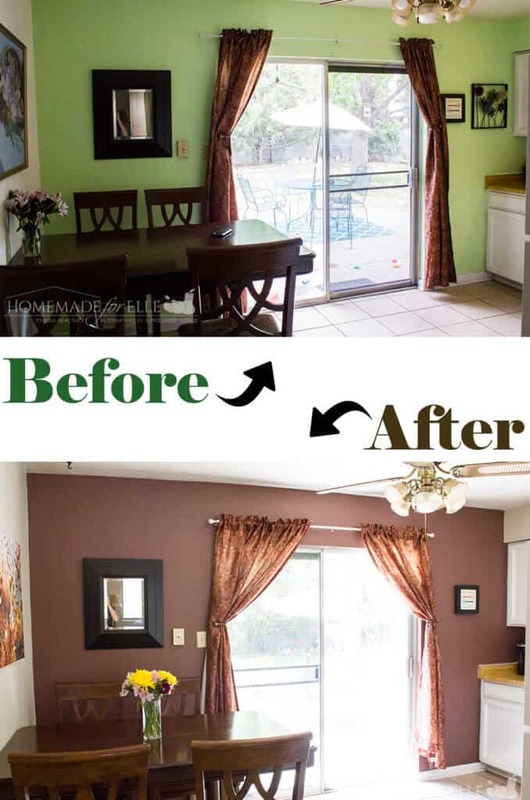 Wow looks a lot different after checking the before and after photos! Good job to you! Looks nicer this time. I love frog tape it really keeps the paint from bleeding. I use to use another tape and it was just a nightmare to redo. That’s such a good tip! I always have some issues with that. Frog Tape is the bomb! 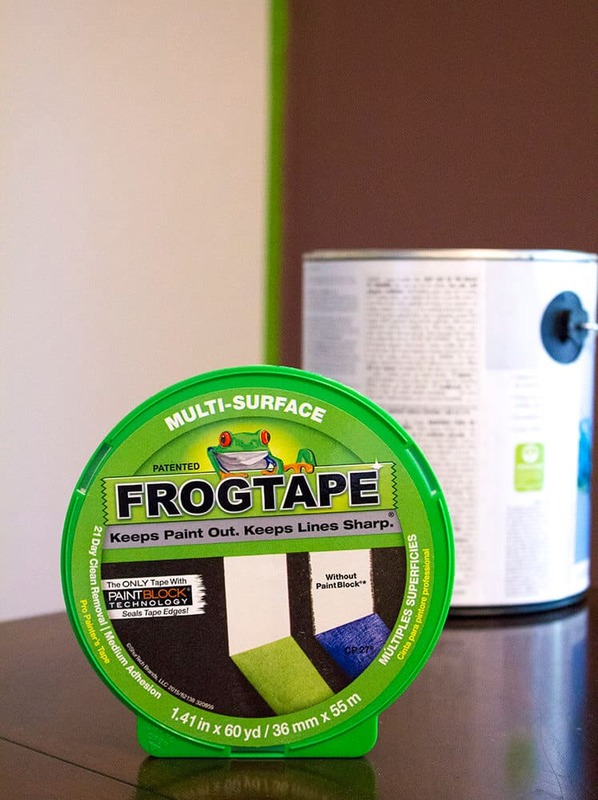 I have heard so many great things about the FrogTape® Multi-Surface painter’s tape. Have to remember to add it to my shopping cart for the next time I need to paint the walls. It turned out amazing!! I will really use this tape for our next painting! Thanks for sharing! You did a great job. I wondered about the tape and if it really worked. I will have to try it next time. Those lines look so sharp! I need to find out if they sell this in the UK as I need to paint my hallway soon! What a great tip! We are always fixing up our new home so I am sure it is only a matter of time until we paint! The similar concept you can use whenyou color your nail! Btw, i like your wall paint, very fresh! 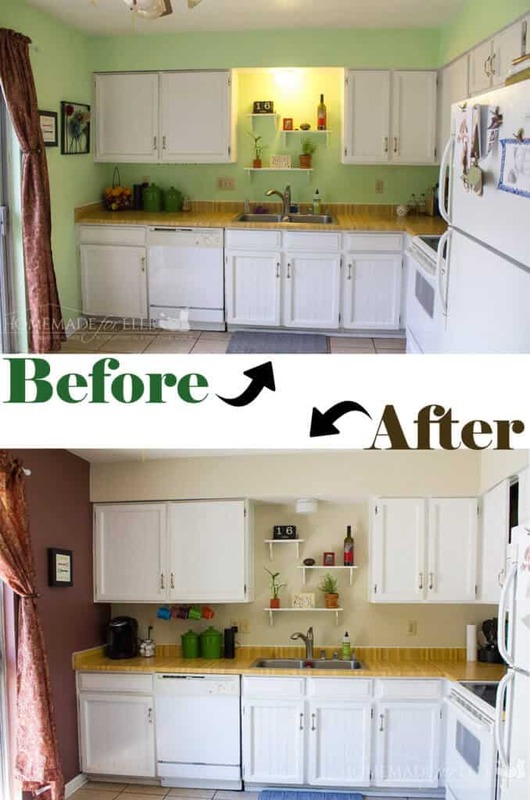 Your kitchen after being painted with new accent wall is so beautiful and cozy. I would consider to use this FrogTape for my next painting job to decorate my old room. Thanks for sharing this useful information! Ohhhhhhhh this is awesome. This tape is seriously hands down the best. We use it for anything we paint because it really does help keep lines clean and perfect. P.S: I LOVE your kitchen color. Your kitchen is so big and spacious. I wish I had that kind of big kitchen. 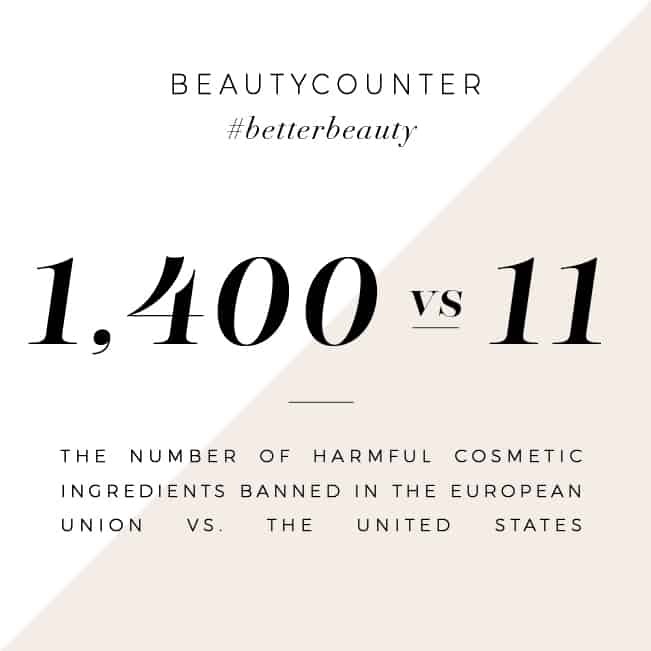 Love all the tips you are sharing with us. Will definitely try this tape for the next painting job. I wish that I had had some FrogTape® Multi-Surface paint tape when I painted a lot of the rooms in my house. I had such a terrible time getting sharp borders. Love the big changes your paint made.We use Frod Tape for all our painting and home improvement jobs. I need to use this tape for my next painting job. I love this color.